Lakes, Gazebos and Fishing in Muirfield Village - Muirfield Association, Inc.
Muirfield Association owns 12 private lakes throughout the village that are perfect for fishing or just relaxing by. A number of lakes have benches and two have gazebos. View a map showing the location of all Muirfield lakes. Enjoy a relaxing day of fishing without ever leaving the area! Bring yourself, friends or family plus lawn chairs, all equipment and bait and you'll be ready to fish! Muirfield Village fishing lakes are fully stocked with crappie, catfish, large-mouth bass and blue gill. Because the lakes are privately owned, an Ohio fishing license is not required. The largest lake is at the Holbrook Recreation Complex off Muirfield Drive. The Holbrook parking lot is conveniently located near the lake. Restrooms are available seasonally at the pool. 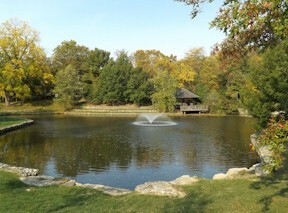 Two peaceful gazebos are located lake-side in Muirfield Village. One is by the large lake off Muirfield Drive and the other at Lake Denise (on the north side of Memorial Drive just west of SR 745.) Gazebo use is reserved exclusively for Muirfield residents and their guests. 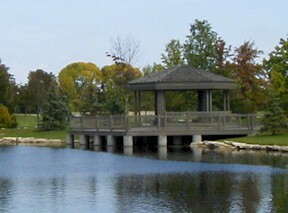 The Muirfield Drive gazebo has been a location for events for residents, such as the very successful Muirfield Social Activities Committee's Fishing Derby, city-led Talks in the Park, and several police safety programs. The gazebo can be reserved free of charge by residents for events such as a family and friends gatherings. (Groups outside of Muirfield, such as church groups, companies or scout troops, may not reserve the facility unless otherwise approved by the Board of Directors.) The gazebo affords access to the fully stocked fishing lake and surrounding grounds. The Holbrook pool, seasonally-available restrooms, a playground, and parking lot are all close by. Residents may reserve the gazebo by contacting us online or by sending in the Request for Usage of Gazebo form. Please read the Gazebo Guidelines online. The Muirfield Village lakes were built to assist with storm water overflow and prevent flooding, which makes them retention basins. Water levels constantly fluctuate through the year. Residents are encouraged to enjoy the beauty and ambience they provide, however, their use is limited. The lakes are not safe for entering. As such, wading, swimming, boating, ice skating and ice hockey are not permitted.